The lead vocalist, lead vocals or lead singer in popular music is typically the member of a group or band whose voice is the most prominent in a performance where multiple voices may be heard. The lead singer either leads the vocal ensemble, or sets against the ensemble as the dominant sound. In vocal group performances, notably in soul and gospel music, and early rock and roll, the lead vocalist takes the main vocal part, with a chorus provided by other group members as backing vocalists. Queen illustrating a typical rock band layout during a 1984 concert. 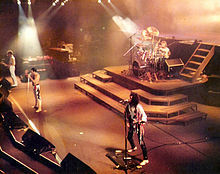 Lead vocalist (frontman) Freddie Mercury stands centre-stage in front of drummer Roger Taylor and positioned between bassist John Deacon and guitarist Brian May. Especially in rock music, the lead vocalist or solo singer is often the frontman or frontwoman, who may also play one or more instruments and is often seen as the leader or spokesman of the group by the public. As an example in rock music, Mick Jagger is the lead singer of The Rolling Stones. Similarly in soul music, Smokey Robinson was the lead singer of The Miracles.